TASCAMs DR-05 brings high-quality stereo recording to an easy-to-use portable powerhouse with a size and price that anyone can handle. The DR-05 records in MP3 or WAV format – including 96kHz/24-bit high-resolution audio ? to microSD or microSDHC media. A pair of all-new microphones handles up to 125dB SPL with the sensitivity to capture every detail. With new recording features like Peak Reduction and Quick Menu the DR-05 puts album-quality recording in the palm of your hand. 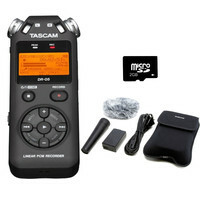 This bundle also includes the Tascam AK-DR11G accessory pack and 2GB micro SD card. This entry was posted in Tascam and tagged Recording-and-Computers. Bookmark the permalink.